Download, evaluate a free software demo from the Price page right now. Simple zip file. Nothing to install. 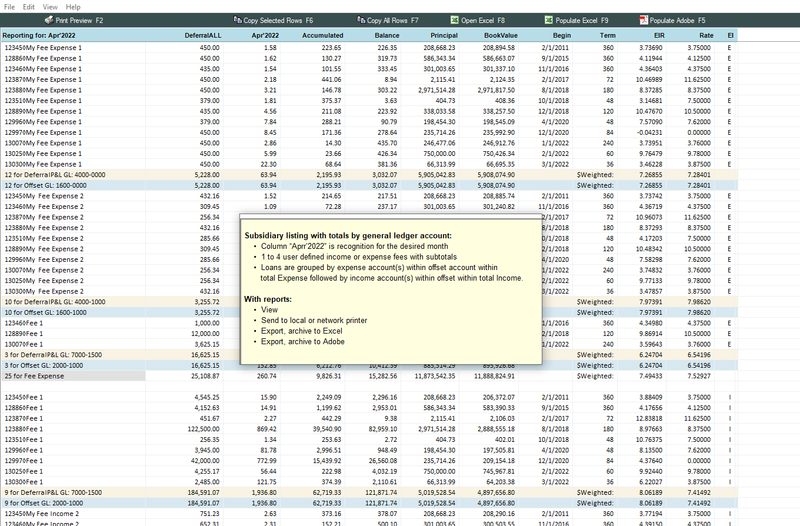 Import sample loans from an Excel template that comes with the software. Run reports and see how easy it is to use. See results for any month. An entire year. Accrual based fee recognition ties to interest income. Available with an option to distribute monthly income and expense for all or selected loans to multiple revenue, cost center general ledger accounts. Audit? Due diligence? What if question? Special loan type? File? Fee? Don't have a loan file? • Enter basic loan information once. • Import the Excel file to the software. Preserve and amortize current balances. For any month. An entire year. A preformatted worksheet comes with the software. interest income is accrued every month. Unique situation? Unusual records? New type of fees? Different file layout? File source? Special internal or regulatory report? Different configurations of the software or other products we offer may already meet your needs. If not, we can write custom code and embed your private module within the existing nuts and bolts portion of the software. We can also calculate a file and provide recognition reports on a one time or recurring basis. • Amortize from 1 to 4 deferred income and expense items per loan. for each income or expense fee. A handy feature at audit time. • Each fee can have its own set of general ledger account numbers. Or, leave account numbers blank and the system will assign default values. • Amortize one set of fees at a time. Amortize all fees at the same time. • The system calculates a new effective interest rate. • The system calculates a new P&I. • Typically due to principal paydowns and curtailments. income or expense for each of the 1 to 4 deferred fees. plus principal and book value accordingly. Early payoff. Sale of loan. Principal drops to zero. 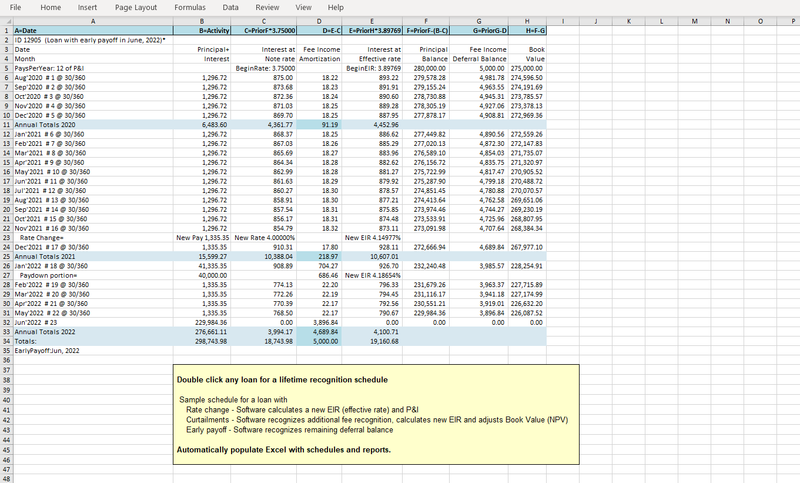 expense balance for each of the 1 to 4 deferred fees. • The software continues the payment stream regardless of non-payment activity. • Deferred fee recognition continues to occur. This logic remains consistent with loan interest income being accrued (earned). The software will continue recognizing a deferral on a delinquent loan until overt, other action is taken. Thank you so much for your help. It’s so refreshing to talk to someone who understands! Our outside accountants just completed their audit. This is the first year we've been using your software AND the first year we received a clean audit report. We have been utilizing FDSSI software to the fullest and we are so excited that we have it to do the calculations for us! I'm not technically inclined but was able to install your software without any problems. Then I imported my loan file. Your software performed all the calculations and totals we need in a matter of seconds. I can't believe how much work it's going to save us each month. A HUGE thank you for going the extra mile plus!!!!!!! Thanks. Your customer service is fantastic! Have a great week. Automatically generate a lifetime fee recognition schedule for any loan at any time. From 1 to 4 unique fee income or expense items per loan. Each fee can be assigned its own set of general ledger debit and credit accounts (or default to system generated numbers). The software recognizes an additional portion of deferred income, expense balance attributable to the principal reduction. When importing from a loan servicing system, the loan is "gone" (for which a report will be provided and loans flagged accordingly). The software calculates a new effective interest rate. The software calculates a new payment. Recognize deferred fees for a span of 2 months through 12 months. Preserve your existing book values. 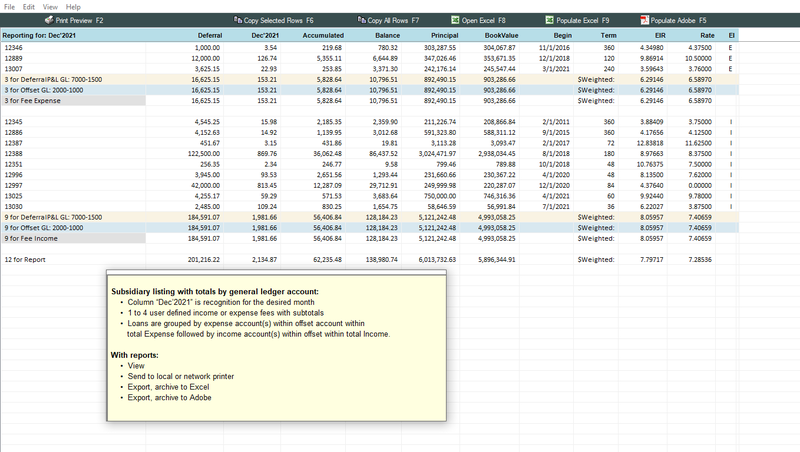 expense balances using current loan information. from original dates using original loan information. Need FASB 91 loan calculations NOW? Don't want to buy software? • Prior accounting and audit periods. Annual totals. Click the link to open and view price page. Send an email requesting a free Excel template. Add a few of your loans to the file (exclude proprietary data). Return the file to us. multiple worksheets demonstrating various capabilities of the system. We can calculate a file on a one-time basis. Deferred fee income and expense amortization for a month. For an entire calendar/fiscal year. Reports and supportive data are provided in Excel. Hundreds of thousands of loans at the same time. The software recognizes the remaining deferral amount. The software accelerates fee recognition proportionate to the reduction. • Other type files. Flexible record layouts. The software calculates effective interest rates and amortizes deferred fee income and expense under FASB 91. Current principal balance for P&I amortizing loans is also calculated in order to determine loan interest income. Fee income and expense is amortized regardless of whether a payment is actually received. Whether a payment has been made or not, loan interest income is earned and recognized each month. As such, deferred loan fees should also be recognized (as opposed to recognition based on cash flow or transaction activity). The software will automatically adjust for changes from a prior month to the current month. a new P&I payment using current balance, current rate and remaining term. • Principal balance reduction other than through normal P&I amortization, such as paydown curtailments. The system compares its amortized principal balance to the imported current balance. and begins utilizing the imported current loan balance. A new effective interest rate is also calculated due to a shorter payout term. • New loans during the current month. An effective interest rate will be calculated for each new loan. • Paid off loans, sold loans, participations sold. The system will recognize deferral balance in full or, for participation sold, a proportionate amount of the deferred fee. • Loans which may have just "gone away". Many times, paid off loans are purged from the servicing file only at year end. Regardless of why a loan goes away, If any fee remains the system will recognize the deferral balance in full. The software maintains a monthly Master File which will be saved for the current month. Master Files are used for comparing an import file to the previous month's file status. Master Files can also be imported at a future date to facilitate reporting for internal purposes, audits and exams. For a month. Quarter. Calendar or fiscal year. Currently using another method? Another system? No system? 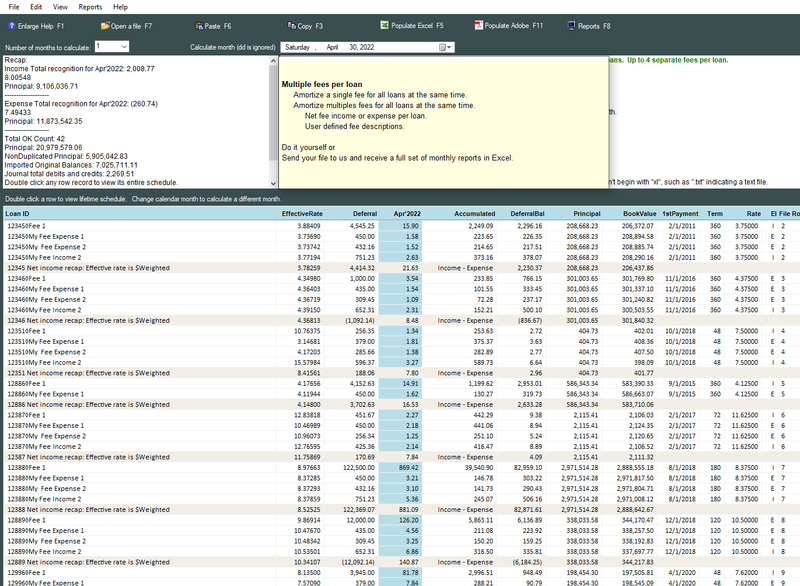 The software can recalculate deferral balances for current and prior periods. Or, the software can preserve your current deferral balances. No general ledger adjustments necessary. • New loans: The system performs calculations using original loan information. 1) The system can "bring loans current" if original loan information is available. Calculate a file for current and prior periods. 2) Or, the system can use current loan balances, current deferred fee balances and so forth. The system can calculate a remaining term based on loan balance, rate and payment. • Utilize balloon and non-amortizing features to amortize leasing fees over lease term. • Accommodates both zero interest rate as well as lease payments incorporating an interest rate. - In a matter of seconds! Enter loan data and fees. Download loan data from a mainframe. 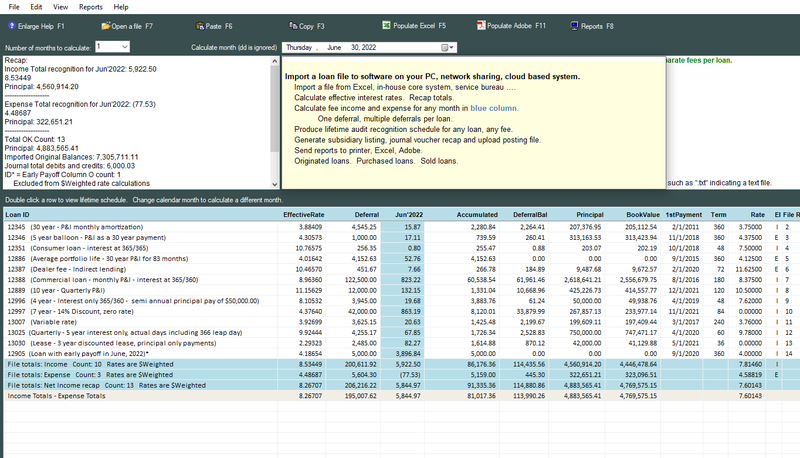 Export calculation results and reports to Excel. Or save loan worksheets with a unique monthly name. Import, calculate, report at any future date. Calendar date selection determines effective month. Supports single or multiple paydowns. Put date and paydown amount in the file. The system will automatically accelerate deferred fee recognition for the paydown amount. A percentage of the paydown/loan balance will be used to recognize that portion of the deferral. A new effective interest rate will be calculated based on the new remaining term. Accepts multiple paydowns for the same loan. Including separate, multiple paydowns in the same month. Immediately following a loan number row. Grouped together within a "Changes" section. Early payoff date column to recognize in full prior to end of anticipated term. The software supports one rate adjustment. It also supports multiple rate changes. Put new rate and effective date in the file. Enter as many changes as occur. The system calculates a new payment and recalculates the effective interest rate. Our customer support department would be glad to answer your questions. © 1995 - 2018 Financial Data Support Systems, Inc.